In most plants, exposure to elevated concentrations of heavy metals results in growth inhibition (see Chap. 8). After prolonged metal exposure, sensitive plants develop visible symptoms of toxicity such as chlorosis and necrotic lesions. During the past two and half decades, symptoms of metal toxicity and deficiency have been described extensively (Marschner 1995). However, our knowledge of the biochemical basis of metal toxicity symptoms in plants is still sketchy. It is known that heavy metals can bind to functionally important domains of biomolecules and thereby inactivate them. The result is, for instance, the inhibition of an enzymatic reaction and a disturbance of metabolism (Van Assche and Clijsters 1986). Furthermore, heavy metals have been demonstrated to stimulate formation of free radicals (FR) and reactive oxygen species (ROS), either by direct electron transfer involving metal cations, or as a consequence of metal-mediated inhibition of metabolic reactions (Halliwell and Gutteridge 1984; Elstner 1990). If the plant cell cannot match the increased rate of FR and ROS formation with an increased activity of the antioxidative machinery, uncontrolled oxidation and radical chain reactions will result in oxidative stress. Therefore, the degree of cell damage under heavy-metal stress depends on the rate of FR and ROS formation, and on the efficiency and capacity of detoxification and repair mechanisms. A comparison of closely related metal-sensitive and -tolerant species or ecotypes suggested that an enhanced oxidative defence is not a particular trait conferring heavy-metal tolerance to plants (De Vos et al. 1991). 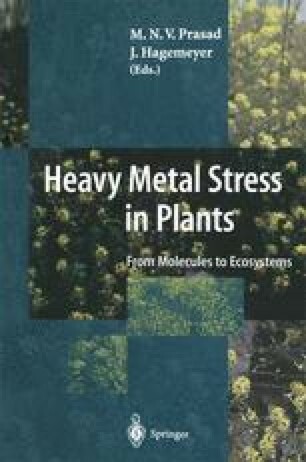 Metal-tolerant plants are usually efficient in avoiding the occurrence of toxic concentrations of of free heavy metal cations in plasmatic compartments, and thereby avoid the development of oxidative stress (Woolhouse 1983).